Ok, I might have missed this Ovo Chair because Little Miss A. has been out of the high chair for a while, but WAO! Its sleek and gorgeous. So now even the babies can be in style with their dipped leg furniture like the adults and kitchens everywhere can stay chic. And out of this craze for dipped legs this Organic Modernism chair is my favorite. I love the wood, and the lines, and of course, the turquoise doesn't hurt either. I bet you could IKEA hack the Antilop high chair by painting the lower end of the legs to make a similar effect. 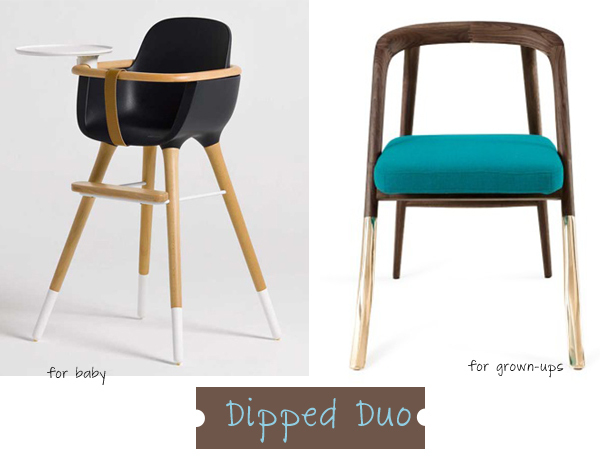 Do you like when baby furniture imitates grown-up furniture? I do! I once gave a good friend of mine the Kartell ghost kid chair as a baby present. I thought it was a cute idea because they have the regular Louis Ghost chairs in their dining room. Yes! I really want to dip my plain kitchen stools...seeing furniture like this convinces me that I should just do it already!! This doesn't get old for me...love it. You could dip the legs of a crib, too! My kids are way too old...but someone should.